. : FAMILY HOTEL KNIAZ BORIS - SOFIA :. Me and all the hotel staff are pleased to welcome you to Hotel ''Kniaz Boris''! We know, that regardless of your destination, there is a wide selection of hotels. We hope you will appreciate positively your stay with us and we look forward to welcoming you again in the near future! 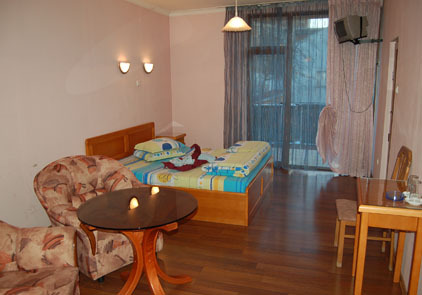 Family Hotel ''Kniaz Boris'' is located downtown Sofia. Its location and good transport communications create convenience for business and tourism. The hotel has a disposition 21 double rooms and 4 apartments with private bathrooms and TV each. All rooms are comfortably furnished with furniture of fresh wood, and decorated in different colours- each of them owns its individuality. Our lobby bar is comfortable place for relaxing meeting over a cup of coffeel; and the courtyard is decorated with many flowers and greenery, conductive to a pleasant atmosphere for relaxing. At the reception polite and smiling administrators are welcoming you, readyto answer all your questions, providing you with comprehesnive information and expertise. Please, select initial date and end date of your stay, in order to check availability of rooms, which offers our hotel for the selected period. 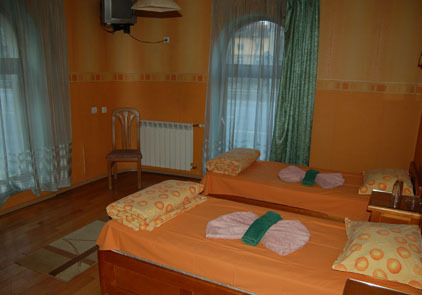 Family hotel ''Pop Bogomil'' is located in the city center of Sofia, in a quite and calm street. The Hotel offers 10 rooms, with a private toilet and bathroom, and a television. 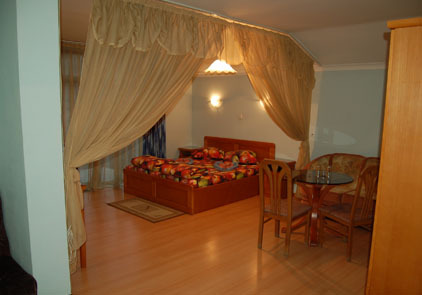 Family hotel ''Stivan Iskar'' is located in the city center of Sofia, in a quite and calm street. The Hotel offers 7 double rooms and 4 apartments, with a private toilet and bathroom, and a television.